The active ingredient of the drug, trenbolone enanthate, is a well-known steroid for experienced athletes. It is recommended for use mainly for men, and only if there is an appropriate level of training. Since this is a relatively heavy steroid, it is not advised to beginners (in the early stages, safer analogues, for example, turinabol or boldenone, are also capable of excellent results). 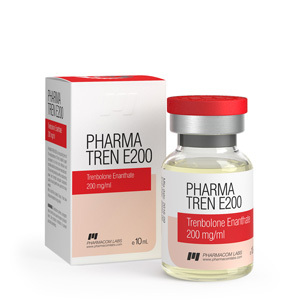 Pharma Tren E200 is a modification of nandrolone, not confirmed aromatization (does not aromatize under the influence of the aromatase enzyme, which eliminates the risk of gynecomastia and fluid retention). On the other hand, during the course, progestogen activity may be enhanced, which may later lead not only to a decrease in libido, erection and atrophy of the testes (due to a decrease in the testosterone production), but also to the formation of gynecomastia. Some androgenic side effects are possible due to Pharma Tren E200. It can be acne acne, sebaceous skin (increased oily skin), increased aggression and other disorders. Women should be especially wary of the side effects of virilization (viril syndrome), which include: body hair and male pattern, changes in jaw size and body shape, even coarsening voice. Pharma Tren E200 reviews from PharmaCom Labs are described as a powerful and simply worth steroid. Using it for sports purposes, although with some risks, with the right approach provides maximum results that are unattainable for safer counterparts. In addition, due to the long duration of action (about 10-14 days), the steroid does not require frequent injections (no more than 1-3 times a week), which is another plus. Recommended storage conditions for Pharma Tren E200: this steroid should be kept out of the reach of children and pets; storage temperature should be no higher than room temperature; storage place is completely dry and dark.